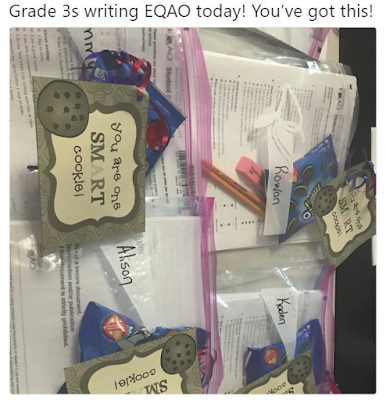 In Grade 3 in Canada, many students write a standardized test for the Education Quality and Accountability Office (EQAO). At one school, the kids' Principal tweeted out her note of encouragement, along with a photo of the test packages that the school had prepared for the 8 year olds. Included with each was a package of Oreo cookies. My response was to point this out as a great example of how there is no longer any occasion too small to not use junk food to reward, pacify, or entertain children. "I’m missing the reason for concern. I hope it isn’t unusual for children to be celebrated in schools for all sorts of achievements, activities, or just building a positive school culture." Call me a dreamer, but I don't think positive school culture needs to be built out of Oreos. That a principal, and the chief psychologist of a school board, both of who I have zero doubt care tremendously about their students, see no problem with schools teaching 8 year olds that junk food rewards effort and/or relieves stress really speaks to just how entrenched and normalized our unhealthy relationship with junk food has become. How about an extra 15 minutes of recess in between test blocks if stress is a concern? Or stickers for a job well done, or a come in your PJs to write day if reward is the issue? And taking a step even further back, should we really be teaching 8 year olds that the simple expectation of their writing tests in life is an event worthy of anything other than being proud that they did their best in writing and/or studying for it?